Jelena Volkova was born on April 18, 1949 in Valmiera, where she spent the first two months of her life. The sculptress spent her childhood and adolescence in Riga, where she finished high school and Secondary School of Applied Arts, the department of decorative sculpture and design; she also graduated from the Latvian Academy of Arts, Sculpture department with distinction. During the school years Jelena visited folk art studio, and already at the age of 14, the artist was awarded for M. Gorky’s old Izergil portrait and conferred – honorary master of folk sculpture. After graduating from the Latvian Academy of Arts J. Volkova’s diploma work “Figurative portrait of German Sculptor Ernst Barlach” was displayed at the USSR exhibition of sculpture diploma works in Moscow, where it got the first prize. Despite the fact that after the graduation the new sculptress is offered the position of Sculptors’ Artistic Council Chairperson at the combine “Art”, as well as a workshop space, she decides to move to Daugavpils. Since 1977 the talented sculptress, artist and graphic artist has lived and worked in Daugavpils. The first workplace of J. Volkova in Daugavpils was in the Commerce Department, where she worked on the original interiors of shops and cafes. Soon, she was provided with a workshop space where the artist could creatively express herself. In 1977, Jelena started actively participating in all the important sculpture exhibitions, mainly in Riga. In the same year at the state exhibition the artist received an award and was admitted in the Latvian Young Artists’ Union for her portrait “Sonny” (Dēliņš). 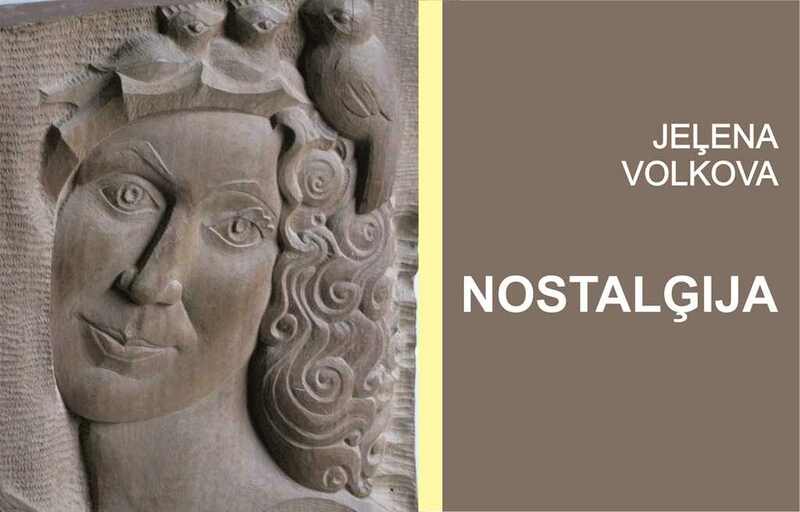 From 1980 to 1988 J. Volkova worked on the monumental decorative sculpture group of objects “Latgale, We are Your Children” (8 objects) and on the project of improving the adjoining area. This work of art has no analogues in Latvia; it is unique both in its intent and tectonic performance. The ensemble is dedicated to the children of Latgale and is located in the yard of the Elementary School “Saskaņas”. Unfortunately, the visual effect of the composition is diminished by its material- flimsy white cement instead of natural sandstone. In fulfilling her dream, from 1988 to 1993 in the centre of the city near the Catholic Church, Jelena realized the sculpture garden project, which was carried out with the support of city municipality, in cooperation with the city’s municipal economy. In the sculpture garden, which at the time was recognized as the best in Latvia, were placed the best works of Latvian, Lithuanian, Estonian, Armenian and Russian sculptors. Unfortunately, this park did not make the city inhabitants happy for long- only the park area remained untouched, whereas some of the sculptures were irreversibly smashed up, the others- damaged… One of the sculptures that survived is J. Volkova’s work from granite “Ikars, Morning” (it is still ready to fly). In 2004 in the city centre- the square of A. Pumpurs near the Aleksander Nevsky Orthodox Church there was placed the Monument to Innocent Victims of the Red Terror. The author of this monument – J. Volkova. Not far from this place, in the yard of Vienības Elementary School is located another work of J. Volkova –the granite memorial sign “Lāčplēsis” dedicated to A. Pumpurs. It should be noted that many stone, bronze and wooden works of the talented sculptress are in Latvian Art Fund, Daugavpils Local History and Art Museum, as well as in private collections in Latvia and abroad. Since 1977 Jelena Volkova constantly participates in all major exhibitions in Riga, Daugavpils, Rezekne and other places of Latvia, as well as abroad – in Lithuania, Belarus, Germany, Netherlands and Sweden. Her works are always fascinating for classical sculpture admirers. In the exhibition “Nostalgia” there are displayed sculptural works, mainly created during the 20th century and they reflect the artist’s charismatic personality. All the works displayed at this exhibition are made with different materials.